Yours truly was invited to the grand opening of the new Viejas Hotel, located in the rolling foothills of Alpine next door to Viejas Casino and across the street from the popular Viejas Outlets. Their new name is Viejas Casino & Resort. 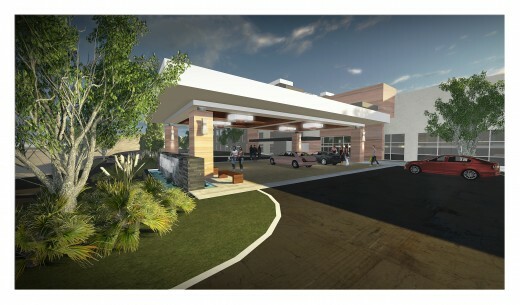 Did you know: the Viejas Band of Kumeyaay Indians becomes San Diego’s fifth tribe to open a hotel connected to its casino. The shindig will include a ribbon cutting, traditional Kumeyaay songs and a Native American blessing, and sneak peek of “Rise,” a dramatic new Cirque-style show that premieres at the hotel this Saturday, followed by a spectacular fireworks display. I can’t wait! The sophisticatedly modern $36 million hotel is 5 stories high and features 128 rooms (including 29 suites), a pool and hot tub with cabanas (SO SoCal! ), state-of-the-art fitness center, free Internet/WiFi, and an expanded all-you-can-eat buffet next door. 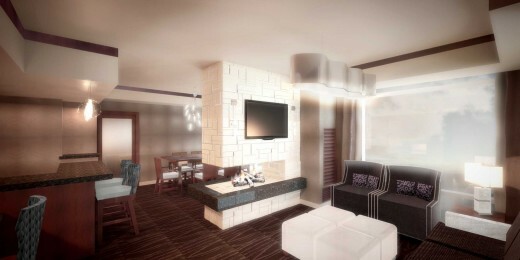 Each room has 40″ Samsung TVs, locally made furniture and art, nightly turn down service, his and her robes (nice touch! ), iPod clock radios and Gilchrist & Soames bath and body products. Some suites even include fireplaces, tubs with whirlpool jets (just say ahhh!) and wet bars (I’ll toast to that 😉 ). A few months back I explored the model guestrooms and I’ve got to say, they’re swanky, warm and inviting, with a metropolitan touch that reminds me of chic boutique hotels in Manhattan. There’s nothing else like it in these parts! This spring as you explore the wildflowers of East County, stop by Viejas Casino & Resort to play the slots, shop 60 name-brand outlet stores, indulge at the buffet and rest your head for a memorable overnight stay amidst the beautiful backdrop of Alpine’s rural setting. Insider tip: While you’re there, pick up a $5 bag of fresh avocados or oranges from one of the roadside vendors! 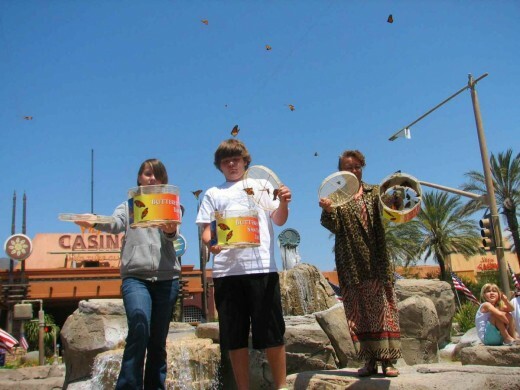 And planning ahead… Time your visit to also check out Alpine’s 16th Annual Sage & Songbirds Garden Tour on May 3-5, featuring a free festival at Viejas Outlets that includes a live butterfly exhibit and daily butterfly releases, plus an outdoor plant and art sale. There will also be garden tours of local bird- and butterfly-friendly home gardens and the Sky Hunters raptor rehabilitation facility, home to magnificent hawks, owls and other bird of prey. Cost for the gardens/Sky Hunters tour is $15 per person before April 1. This Is Why They Don’t Call It San Diego Hold Em’! The other weekend, the guys and I took a little trip to a destination famous for its gambling opportunities and had a great time. But in truth, I spent very little time at the tables and slots. Why did I forgo this intregal part of the trip, you ask? 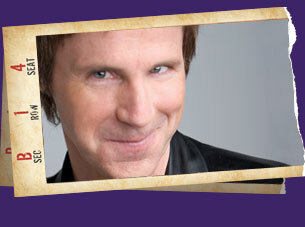 ‘Cause I’ve got plenty of opportunities to gamble here in San Diego when the mood strikes! 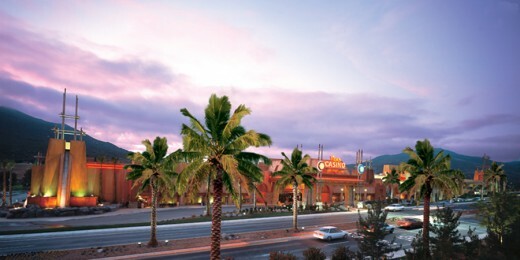 San Diego has numerous Indian Casinos in our East and North county regions. In all honesty, I’m not a huge gambler but do enjoy it for the entertainment value every once in a while. After a few months of playing poker online, I work up the courage to head over to one of the Indian Casinos and try my luck with some real money. 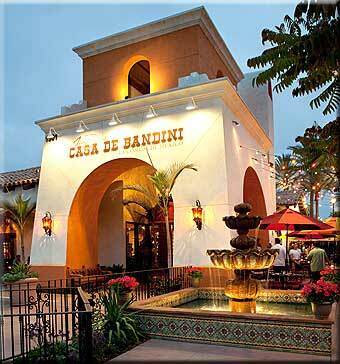 San Diego casinos that I’ve visited and enjoyed are: Barona Valley Ranch Resort & Casino, Sycuan Resort & Casino and Viejas Casino & Outlet Center. My last casino visit was to the Barona Valley Ranch Resort & Casino a couple of months ago. Barona recently won like 25 awards for their casino, so I figured I should roll someplace recognized as a leader in their field. Unfortunately, my online Texas Hold ‘Em skills weren’t quite honed to perfection that night, and the fine ladies and gentlemen at my table quickly added my $40 to their stacks of chips. Vowing to return one day and sweep the table, I cheered myself up with an amazing steak dinner at Barona’s Oaks Steakhouse – absolutely fantastic! Definitely one of the better steakhouses that I’ve eaten at. If you’re a casino regular, you’re also well familiar with the concept of the casino buffet. I’ve had the pleasure of eating at Barona’s Ranch House Buffet, and I gotta say that my mouth still waters thinking about it. Now, I’m not a huge buffet guy, but when I do a buffet, I do it big! The Ranch House Buffet has multiple islands of different types of foods (I think my first plate had sushi, macaroni & cheese, salad and carne asada on it). I definitely ate my fill that day! In fact, I’ve even been tempted to drive out to Barona just to do Sunday brunch there!